Inspired by his own journal writing across 15 years, this book shares with us some of Mark's most personal work. Many passages arise from accounts of his own life events--moments of "sinking and being lifted"--and the insights they yielded. Through these passages, we're encouraged to navigate our own currents of sea and sky, and to discover something fundamental yet elusive: How, simply, to be here. 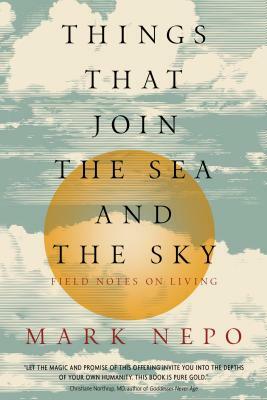 To be enjoyed in many ways--individually, by topic, or as an unfolding sequence--Things That Join the Sea and the Sky presents 145 contemplations gathered into 17 themes, each intended to illuminate specific situations. The themes include: Unraveling Our Fear, Beyond What Goes Wrong, The Gift of Deepening, The Practice of Relationship, What Holds Us Up, Right-Sizing Our Pain, The Reach of Kindness, Burning Off What's Unnecessary, How We Make Our Way and many more. For those interested in either beginning or expanding their own journaling explorations, this reader also provides a guide to the practice of daily writing, with 100 compelling questions to get us started. "Joy is the sea that holds all," writes Mark, "the Unity of Being where feelings don't separate, but surface like waves to remind us we are alive." Here, he helps us swim in those waters until we are held in the mystery of their buoyancy. Mark NepoMark Nepo is a poet and philosopher who has taught in the fields of poetry and spirituality for over 35 years. A New York Times #1 bestselling author, he has published 19 books and recorded 14 audio projects. Mark has been interviewed three times by Oprah Winfrey as part of her Soul Series radio show, and was interviewed by Robin Roberts on Good Morning America. As a cancer survivor, Mark devotes his writing and teaching to the journey of inner transformation and the life of relationship. Mark's work is widely accessible and used in spiritual retreats, healing and medical communities, and more. His work has been translated into 20 languages, and he continues to offer readings, lectures, and retreats. Visit MarkNepo.com for more info.